Apparently there are at least three ways to implement this simple task in Akka and we shall study their pros and cons. After sending Ping we immediately schedule sending Down message to ourselves after precisely one second. Then we go into waitingForPong. If Pong arrives we cancel scheduled Down and send Up instead. However if we first received Down it means one second elapsed. So we forward Down back to the client. Is it just me or maybe such a simple task should not require that amount of code? Moreover please notice that our MonitoringActor is not capable of handling more than one client at a time. Once CheckHealth was received no more clients are allowed until Up or Down is sent back. Seems quite limiting. That's it! We ask networkActor by sending Ping and then when response arrives we reply to the client. In case it was a Success(_) (_ placeholder stands for Pong but we don't really care) we send Up. If it was a Failure(_) (where _ most probably holds AskTimeout thrown after one second without reply) we forward Down. There is one enormous trap in this code. In both success and failure callbacks we can't use sender directly because these pieces of code can be executed much later by another thread. sender's value is transient and by the time Pong arrives it might point to any other actor that happened to send us something. Thus we have to keep original sender in origin local variable and capture that one instead. Same as before we ask (synonym to ? method) networkActor with a timeout. If correct reply arrives we map it to Up. If instead future ends with exception we recover from it by mapping it to Down message. No matter which "branch" was exercised the result is piped to sender. You should ask yourself a question: why code above is fine despite using sender while the previous one would have been broken? If you look closely at the declarations you'll notice that pipeTo() takes an ActorRef by value, not by name. This means that sender is evaluated immediately when the expression is executed - not later when replies return. We are walking on a thin ice here so please be careful when making such assumptions. When the actor is created we send Ping to NetworkActor but also schedule timeout message. Now we wait either for Pong or for timeouted Down. In both cases we stop ourselves in the end because PingActor is no longer needed. 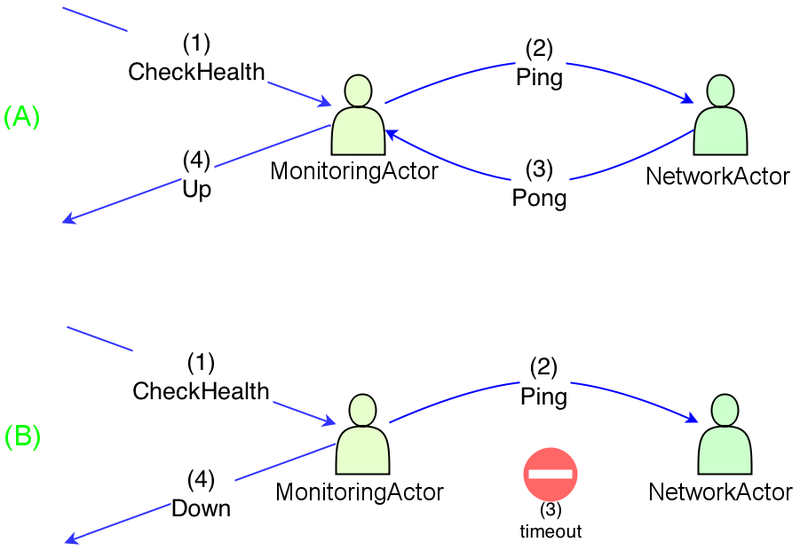 Of course MonitoringActor can create multiple independent NetworkActors at the same time. This solution combines simplicity and purity of the first one but is robust as the second one. Of course it also requires most code. It's up to you which technique you employ in real life use cases. BTW after writing this article I came across Ask, Tell and Per-request Actors which touches the same problem and introduces similar approaches. Definitely look at it as well!